Recycle on the Go bins and are now available at 26 sites across West Lothian including parks, medical centres, partnership centres, community centres and popular public areas. Location of venues can be viewed below. The bins allow local people to separate different types of waste materials for recycling, whilst they are out and about in West Lothian. This is something which is easy to do and is already done by many at home as part of their kerbside recycling service. Executive councillor for the environment Tom Conn commented: "We would like people to be outdoors and enjoying the environment during the summer. We know that people like to eat outside too. Our message is to plan ahead and take a bag so that you can 'bag and bin' any litter - or take it home. This new bin means that people can go a step further and help the environment by recycling their litter while they are out and about." 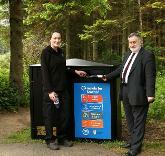 Assistant Ranger, Catherine Thomson said: "The Ranger Service and Country Parks in West Lothian encourage visitors to help us keep our open spaces looking good by putting all their rubbish into either a recycling bin or general litter bin, so the Recycling on the Go initiative is a great boost! No-one likes to come to the countryside and find litter strewn about or irresponsible dog owners not picking up after their pets. We hope that visitors are appreciative of the facilities we have on offer and help us to keep West Lothian litter-free".